Add a little zest to 2019 with our new seasonal short break to Ireland’s south-east and a twist on the House Party theme. Discover Wells House & Gardens, the famous House of Waterford Crystal and enjoy ‘a drink on the house’ at Smithwicks Brewery each with guided tours, and explore miles of beautiful scenery plus the generous hospitality at Dooleys Hotel in Waterford. 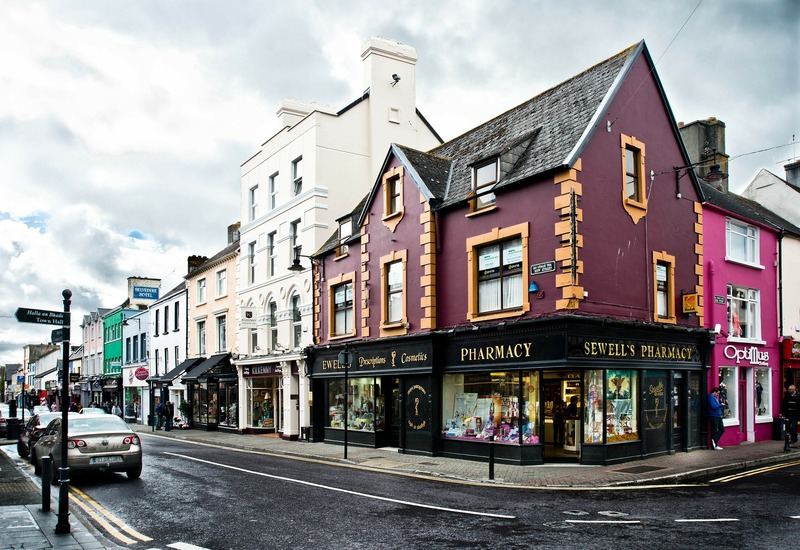 Situated in a prime city centre location boasting views of the River Suir, the hotel is a stones throw from the shopping and sightseeing districts. The excellent quality, family run hotel, has 112 spacious, comfortable and tastefully decorated bedrooms all with en-suite, tea & coffee making facilities, direct dial telephone with voicemail service, trouser press, iron and ironing board, hairdryer, TV and WiFi. This hotel is particularly noted for the good home cooked cuisine. Day 1 – Travel to South Wales and then by ferry to Rosslare and on to Dooleys Hotel in Waterford for a 4 night stay. Day 2 – A day in Waterford begins with a visit to the House of Waterford Crystal (included in your tour) in the heart of town, where a guided tour reveals the secrets of this intimate design process from glass blowing to engraving, skills that have changed little since the company began in 1783. Take time to browse in the showroom and perhaps be tempted by a special piece, some of which is exclusive to the gallery. Spend the afternoon exploring this fascinating city. Day 3 – Begin today with a visit to Wells House & Gardens (included in your tour) that lies just north of Wexford. This magnificent building has stood for over 350 years and the guided tour reveals a history encompassing Cromwell, passionate rebellions and the great famine, with special emphasis on the everyday lives of all the families who lived on the estate. The Victorian Walled Gardens are delightful and there’s a Craft Courtyard with locally-produced arts and crafts. Spend the afternoon in the beautiful harbour town of Wexford, founded by the Vikings in the 9th Century and which has featured prominently in the country’s history. Day 4 – Today we head to Kilkenny, a well-preserved medieval town, popular with tourists and with many original features, built around its magnificent castle and recently named Ireland’s Tidiest Town. Begin with a visit to the new Smithwicks Brewery (included in your tour price) for a tour and tasting of this favourite Irish beer. Free time this afternoon to stroll through the historic streets or why not take a ride on the Kilkenny Road Train (not included) resplendent in the local Kilkenny colours of black and gold, to discover the abbey, cathedral and other highlights of this fascinating city. Day 5 – Return ferry from Rosslare to South Wales and home. Our most popular Irish holiday is a thriving holiday centre with a great atmosphere set in the very heart of County Kerry. Killarney and the south west of Ireland is a Mecca for holiday makers from all over the world. With stunning scenery, pretty villages and most of all, the unbeatable Irish friendliness, this is one of the most desirable holidays. Half Board. Single supplement £157pp. The three superb hotels on this tour offer excellent facilities, including fully en-suite rooms, lifts serving all floors & entertainment nightly. There is a beautiful indoor pool at the Killarney Towers. The overnight hotels are of a very high three star standard and the main hotel, the Killarney Towers, has undergone a major refurbishment and has been awarded four star status. DAY 2 – After breakfast, we head across to the south west via Blarney, arriving in Killarney mid afternoon. We head straight to Ross Castle, where we board the boat for our cruise on Lough Leane, after which we are taken to the excellent four star Killarney Towers Hotel by the famous “Jaunty Carts”, passing through the Killarney National Park. DAY 3 – A free day to explore the delights the town of Killarney has to offer. DAY 4 – Our local guide joins us at the hotel for our spectacular “Ring of Kerry” tour, offering spectacular scenery. We stop at several locations around “The Ring”, and are knowledgeably informed by our guide of many of the interesting and historic places and features we encounter. DAY 5 – Once again, our guide joins us for the day as we head off for another beautifully scenic tour on the Breara Peninsula and destination of Bantry Bay, a truly stunning drive through this area of outstanding natural beauty. Day 7 – We travel to the port for our ferry crossing back to Wales, then travel back home. Anyone who has been on our Irish holidays knows just how good they are, well, we believe we have put together a holiday to beat them all. Based at the excellent, superbly located Ballymascanlon House Hotel, we get to visit not one, but two capital cities. Both Belfast and Dublin are fascinating venues to visit, both with a wealth of history, friendly people, great shopping, cafes, bars and restaurants, plus informative commentary on board boat trips plus free time to take in the wonderful atmosphere, you cannot but admire these wonderful cities. Added to this tour is a trip to the medieval coastal town of Carlingford, an absolute gem. If you love the Craic of Ireland, then you will love this holiday. Located half way between Dublin and Belfast, this 4 star family owned hotel is run with pride and dedication. The impressive Victorian house forms the heart of the hotel which is located on the 140 acre Ballymascanlon estate. All 90 spacious bedrooms are very comfortable and kept to a high standard. There is an elegant, formal dining room with chandeliers, a large bar overlooking the gardens, a cosy lounge and an outside terrace. Leisure facilities include an indoor swimming pool, hydro pool, sauna, steam room and outdoor hot tub. Day 1 – Travel to North Wales and then by ferry to Dublin and on to our hotel in Dundalk. Day 2 – Travel to Belfast harbour and enjoy tea and scones before boarding our guided Titanic harbour boat tour. Embracing the Titanic story both old and new, the boat allows us to view the Titanic quarter from the water and appreciate the vastness of this important industrial era. The tour continues towards the Musgrave Channel where we can view Belfast’s large breeding seal colony. Following the tour, we remain in Belfast’s Titanic Quarter and board HMS Caroline, a World War 1 Battle Cruiser and the last surviving ship from the Battle of Jutland in 1926. Having undergone extensive restoration, this new visitor experience allows visitors to discover Captain Crookes Cabin, the engine room, sick bay and galley kitchen. Following our visit we have free time in Belfast to explore the city and some of its many attractions. Day 3 – Travel to the nearby coastal town of Carlingford, one of the best preserved medieval towns in Ireland with its narrow streets and castle. Carlingford boasts an idyllic location and is situated in the heart of the beautiful Cooley Peninsula, nestling at the foot of Foy Mountain, on the shores of Carlingford Lough and overlooking the Mountains of Mourne. During our relaxing visit we can explore the cobbled streets, old historic buildings, traditional pubs and brightly painted shops. Day 4 – Travel to Dublin and enjoy a 45 minute guided cruise on the River Liffey. We will gain an insight into the history of the city, from the arrival of the Vikings to the impact of the Industrial Revolution. Discover the story behind the iconic Ha’penny Bridge as well as Gandon’s masterpiece, the imposing Custom House. In the afternoon explore at your leisure the many delights Dublin has to offer. Day 5 – After breakfast, we leave our hotel and begin our journey home.